The Tucson Rodeo Parade originated in February 1925. At that time, it preceded the Tucson Rodeo and was a one-day event, both of which were conceived with the thought that they could benefit Tucson’s economy by attracting tourists. The plan worked! Now, more than ninety years later, both are going strong. 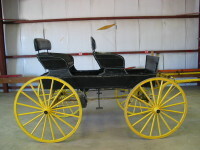 Not long after the first parade and rodeo, the group that was formed to present both the Parade and Rodeo began acquiring horse-drawn vehicles. 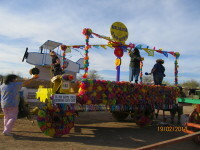 Since 1925, the Parade Committee has acquired over 125 vehicles, most of which were donated. Some have been purchased, such as the Clyde Pierce collection, bought in the 1940’s. 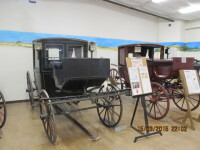 Some committee members have donated personal vehicles, like the wagons donated by former wagon master Roscoe Christopher and his family. Many are single donations in deteriorated, but restorable condition. 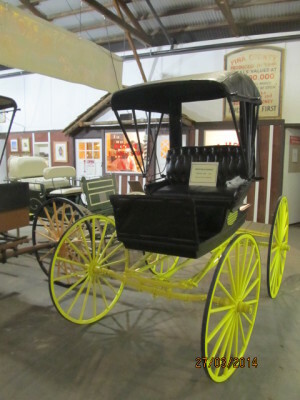 Others are in museum condition like the restored folding-top buggy pictured here, donated by Mr. Dave Ecklund, along with a foot-warmer. Dave’s a snow-bird and wanted to see his vehicle well cared for. 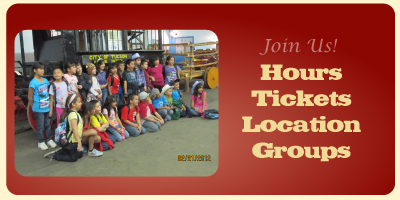 We’re always interested in donations that permit us to expand our facility. Anything historic is greatly appreciated, and we attribute your donation. 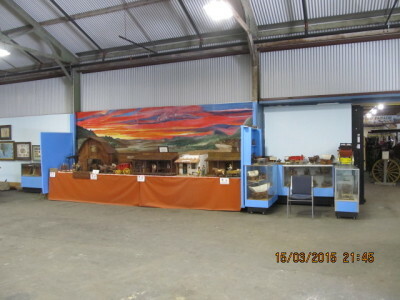 Throughout your visit you will encounter over 100 vehicles in our four display buildings. Main Adobe Building: Among an assortment of vehicles you’ll see several of the Fringe Top Surreys which were actually rented for use in the filming of the movie version of “Oklahoma,” which was filmed here in Southern Arizona. 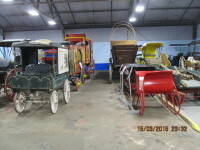 At the far right is a horse trailer, once used by and donated to our museum by Duncan Renaldo, the Cisco Kid. 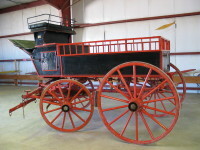 Old Airport Hangar: Here you will find a wide variety of our horse-drawn vehicles to include Tucson’s first chemical fire wagon, the city’s first garbage truck, freight wagons, sleds and sleighs, and circus related vehicles. 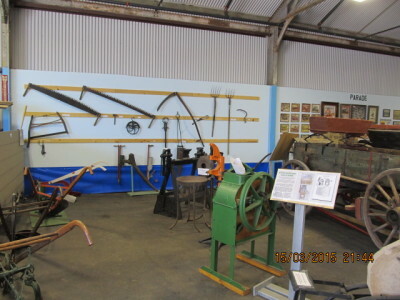 Our farm/ranch machinery and tools exhibit is also featured. Recently an elaborate Cotton Seeder has been restored and added. The wagon in the background is a Studebaker farm wagon. 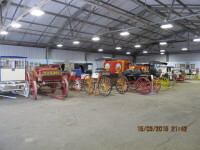 The hangar also has scaled model exhibits of hand-crafted wagons and buildings along with many Wells-Fargo historic pieces. Roscoe Christopher Barn: Holds many pieces which are used in the annual Tucson Rodeo Parade. 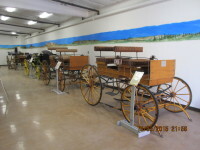 Mud-wagon Stagecoaches, a school bus, English Park Drag coaches, aTucson police paddy wagon, and several vehicles made and donated by Roscoe Christopher, are found here. 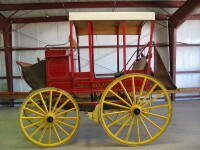 There are also four wagons made here in Tucson by the Frederick Ronstadt Wagon Works – and yes, he was Linda Ronstadt’s grandfather. 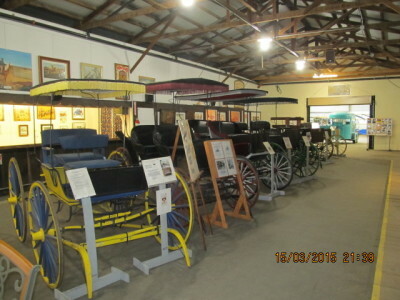 The Buggy Barn: Features include wagons and carriages with rich historical significance. 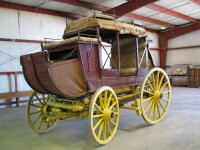 Chief among these is the famous Maximillian & Carlotta coronation carriage made in France; collections from donations made to us by the Noah Webster and Seth Thomas families; carriages used in films by Ava Gardner and Maureen O’Hara and the personal buggy of Andrew Carnegie, among others.